Oh so many ways to video chat. Here is my latest segment on The Early Show showcasing a few ways to have that face-to-face call. And here is a pic of my fave video chat of all time. 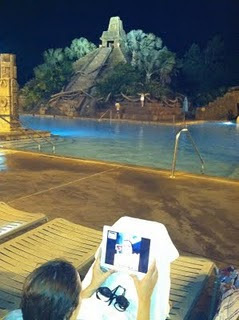 My one sister and I went to Disney World and were having a midnight swim at the volcano pool in Coronado Springs. We knew one of our other sisters was working late at the office so we decided to give her a call and rub it in, priceless!